Polenta and cornmeal are often mistakenly used interchangeably of which they are separate food items. In a nutshell, polenta is a North Italian dish whereas cornmeal is often an ingredient used in making polenta. Polenta was traditionally made of a wide variety of grains. But today it is commonly made of the medium or coarsely-grounded yellow corn kernels. 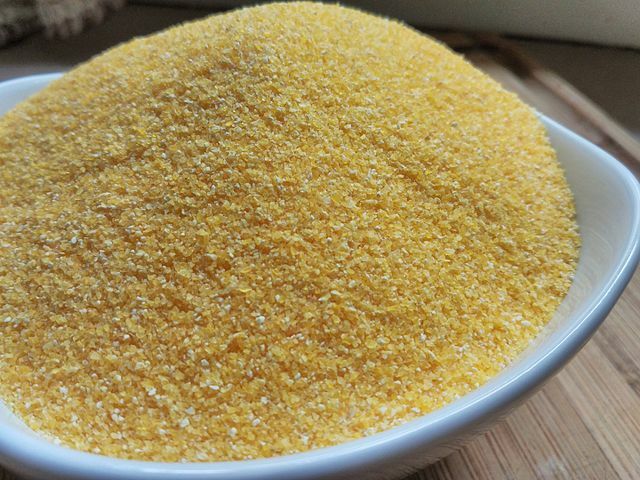 Cornmeal is made of differently ground corn kernels as well as different corn kernels such as blue, white and commonly yellow. This article unfolds the key differences between polenta and cornmeal. As already highlighted, cornmeal is made of corn kernels that were ground into fine, medium or coarse particles. The corn kernel could be blue, white or yellow in color. Traditionally, stone-ground corn kernels were used and they were liked because they leave the cornmeal with immense nutrients because of the germ and hull. However, it was perishable because of the fat content in the cornmeal. Modern grinding methods use steel, which removes hull and germ and then extends the shelf-life of cornmeal. Cornmeal is basically an ingredient in many dishes including polenta. It is used to add texture and enhance the flavor of dishes. Some recipes may call for different types of cornmeal. It could be a fine, medium or coarse type. It is also used in cornbread, stews, meat, muffins and many more baked products for its flavor-enhancing and texture properties. Cornmeal is often packaged in tins. Unless the tin states otherwise, it is assumed that the commercial cornmeal is a medium-ground type. Even a fine cornmeal has some texture in it. Further details such as the cornmeal type made from blue, white or yellow corn will also be printed on the packaging. Also, a stone-ground cornmeal is indicated. If there is no indication, it is assumed that it was ground used steel-rollers which increase its shelf-life. A fine cornmeal is often labeled as corn flour and in some recipes it may be referred to as cornstarch although cornstarch is not derived from the entire corn kernel. To prevent the flour dough from sticking, cornmeal can also be added when preparing for pizza. It also adds sweetness flavor in cookies. There are many uses of cornmeal in modern dishes. Polenta is an Italian dish, not an ingredient as cornmeal is. Polenta is commonly made of a yellow corn kernel ground medium to coarse. A finely ground corn kernel is not desirable as it will produce a pasty polenta with compromised texture, consistency and flavor. Polenta was, however, made of many grains other than corn kernels. These included chickpea flour, chestnut flour, coarse rice, and buckwheat meal. 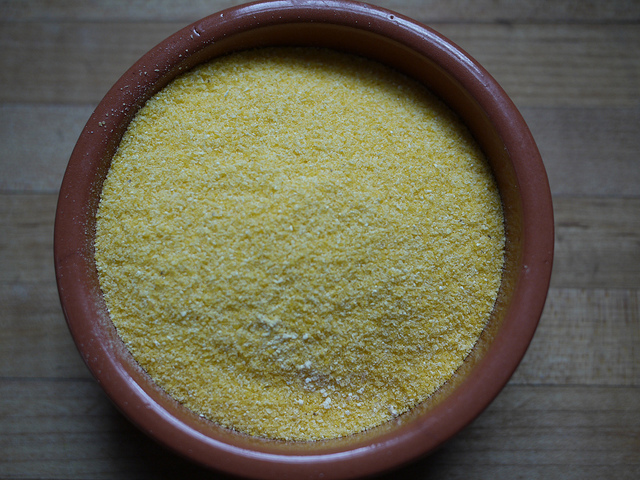 Cornmeal-made polenta is now a predominant form of polenta well-known across the world. Cornmeal is combined with other ingredients such as cheese and butter to make polenta. Cornmeal packages may be labeled as polenta, meaning they are best suited to make polenta. These are either medium or coarse-ground cornmeal products. It takes about 40 minutes to cook polenta while constantly stirring until the mixture thickens like porridge. It can then be served by cutting it into equal pieces. To cut this cooking time, polenta is often pre-processed and sold as instant polenta or quick-cooking polenta. However, other chefs critique the pre-processed polenta that it compromises the flavor. Cornmeal is made of different corn kernels grounded fine, medium or coarse. A blue, yellow or white corn can be used to make cornmeal whereas polenta is predominantly made of a yellow corn kernel that is either medium- or coarse-grounded. A finely grounded corn will make a pasty polenta. Polenta is a dish originating from Italy. It was traditionally made of any grain other than yellow corn kernel (cornmeal). Cornmeal, on the other hand, is an ingredient that is used to make polenta and an assortment of other recipes such as cakes, muffins, etc. Cornmeal adds sweetness and texture to many recipes. Cornmeal was traditionally prepared by stone-grinding corn kernels which leaved hull and germ to improve its nutrients. But this made it a perishable product. Today is also prepared using steel rollers which extend its shelf-life. Polenta, after making its recipe, is cooked slowly for about 40 minutes while stirring constantly. It can take up to an hour to prepare polenta while cooking it slowly and stirring contantly. If cornmeal package is written polenta it means that it can be used to make polenta. Lusi Madisha. "Difference Between Polenta and Cornmeal." DifferenceBetween.net. 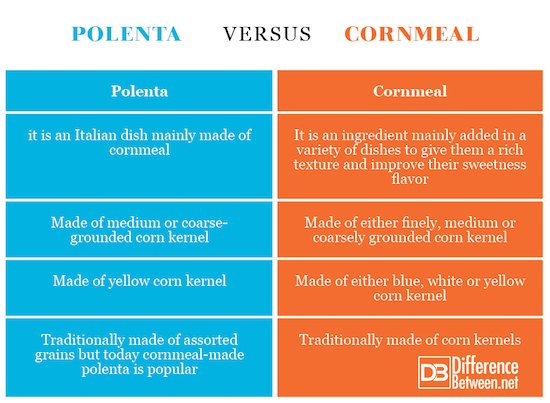 June 7, 2018 < http://www.differencebetween.net/object/comparisons-of-food-items/difference-between-polenta-and-cornmeal/ >.